Goldenrod is a perennial plant that is well-known for its healing properties. This wild edible is a plant that reproduces through its roots, bulbs, stems and by its seed. 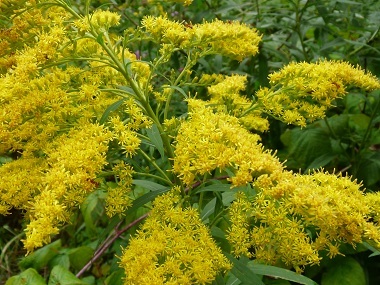 Goldenrod does not cause seasonal allergies as many tend to believe. No one is, no one can be, allergic to Goldenrod pollen. Why? For starters, it has virtually none and it is pollinated by insects. Only wind-pollinated plants such as Ragweed (which blooms at the same time as Goldenrod) can cause allergic reactions.Currently, there are actually 140 varieties of Goldenrod; therefore it has a unique adeptness in crossbreeding with other plants. All varieties of Goldenrod all are equally nutritious and boast many health benefits. 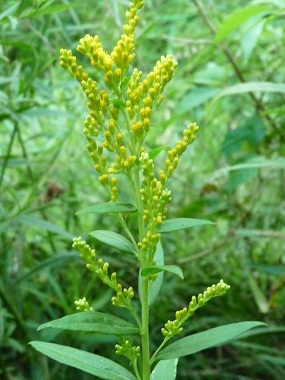 Goldenrod can be used fresh or as a dried herb to make tea (although it is bitter), or as a fluid extract, tincture, or in capsules. Nebraska declared a type of Goldenrod (Soldiago gigantea) the state flower in 1895. Distinguishing Features: Long wood like stems with spiky tooth like parts which are widely-spaced, yellow flowers that grow in thick clusters. Flowers: Goldenrod flowers grow as an inflorescence in a broad or occasionally narrow pyramidal panicle. They can be anywhere from 5 to 40 cm (2 to 16") high and nearly as wide.There are several to many horizontal branches, the upper sides of which carry numerous, densely-crowded small heads of golden yellow flowers. Each individual flower head measures about 3 mm (1/8") long and wide. Goldenrod flowers from mid-July to September. 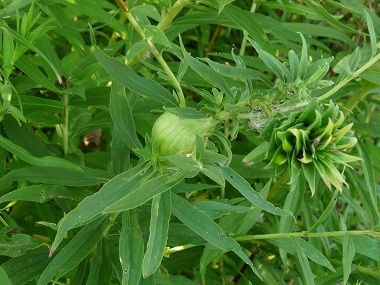 Fields of Nutrition has medicinal benefits and vitamin/mineral content of Goldenrod. Leaves: There can be wide variations in characteristics, but generally, goldenrod leaves are about 10 cm long and 2 cm wide, tapering to a point at the tip and narrowing at the base, with no leaf stem and small teeth around the edges. Three veins run parallel from near the base of the leaf.. The underside of the leaf is hairy, especially along the veins and the upper side has a rough texture. Height: Most Goldenrod plants average 1 metre in height. 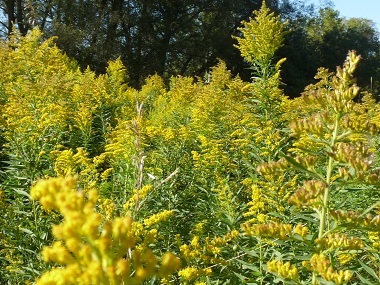 Habitat: There is no shortage of Goldenrod in September and October. This yellow plant can be found in moist locations, forests, fields, roadsides, compost piles, cultivated fields, and orchards throughout Canada, the U.S., and across the world. Edible parts: All aerial parts of the plant can be used. The flowers are edible and make attractive garnishes on salads. Flowers and leaves (fresh or dried) are used to make tea. Leaves can be cooked like spinach or added to soups, stews or casseroles. Leaves can be blanched and frozen for later use in soups, stews, or stir fry throughout the winter or spring. For more in-depth information (e.g. nutrition, medicinal values, recipes, historical information, harvesting tips, etc.) please check out our Goldenrod PDF magazine.